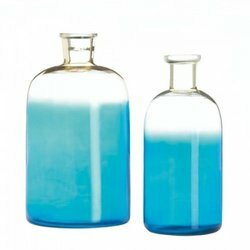 You'll be happy to give your decor the blues with this pretty duo. Two glass bottle vases feature an ombre blue design, small bottleneck openings, and tons of style! Small: 3 x 3" x 9" high; Large: 5" x 5" x 10" high.